President Xi Jinping has dealt with the United States for almost three years as relations have declined. His bold and assertive actions in areas sensitive to US interests departed sharply from past restraint and put an aroused America on guard. It is hard to give these results a passing grade. As they did in Washington on September 24-25, the two leaders continue to meet and achieve agreements in limited areas of mutual interest, but rising American debate over China policy is fed by Xi’s repeated affronts and seemingly cavalier treatment of US concerns. Americans seek means to get Xi Jinping’s China to stop taking actions seen as offensive in the East and South China Seas, in cyber economic espionage, in state-backed intervention in currency and Chinese domestic markets that disadvantage US companies; in using China’s large foreign exchange reserves and other means to support self-serving Chinese-backed development institutions at odds with those backed by America; in continued rapid development of military forces aimed at Americans; and in stronger repression of Chinese peoples’ political freedom and related human rights. Xi Jinping continues to see advantage in undermining American interests in these areas. This plays well with domestic audiences in China. Approaching the end of his term and reluctant to apply American power in foreign affairs, President Barack Obama complains but seems passive and weak in dealing with Chinese challenges. Current trends forecast trouble ahead with hardening American attitudes running up against self-absorbed and self-righteous Chinese assertiveness. Veteran observers of Sino-US relations would likely argue for some grading leniency for Xi as his assignment is difficult; Chinese and American leaders long have had difficulty managing differences while trying to advance common ground. President Richard Nixon and Chairman Mao Zedong set strategic understanding between the two powers focused on an expanding Soviet Union. US-China relations were often troubled, but common concern with the USSR kept disputes in check. The end of the Cold War coincided with the Tiananmen crackdown and the end of the Soviet Union. These developments shattered the foundation of Sino-American cooperation. These failures come from strong and enduring Sino-American differences, which are deeply rooted in both countries’ views of their history, interests, and values. Heading the list for China is opposition to US international leadership, explicitly favoring a multipolar world; Beijing opposes US support for Taiwan and others who disagree with China, and it guards against alleged US schemes to undermine the Chinese one-party political system. Beijing also works against the United States in Asia, endeavoring to weaken the alliances and strong security presence along China’s periphery, which is seen as a strategic threat to the country. The American differences with China focus on US determination to sustain global and regional leadership; China’s sovereignty and security ambitions as well as its employment of coercive means against neighbors, many of which are allies or close partners of the United States; China’s state-directed economic manipulations that result in substantial US economic losses; and China’s negative human rights record. Under these circumstances, aspirations for major breakthrough in relations seem unrealistic. Practice shows wisdom in seeking more modest expectations based on pragmatism influencing both sides. Such behavior emerged at the start of the twenty-first century after a decade of repeated turmoil and periodic dangerous confrontation. China at this time broadened efforts to reassure neighbors that its rise was not a threat. Officials put aside strident criticism of the United States in favor of a focused effort to reassure it. They said that the alternative risked the United States and other concerned powers working together to resist China’s rise, noting that such experience of rising powers in the twentieth century had led to their destruction. On the US side, the initial toughness of the George W. Bush administration subsided beginning with the September 11, 2001, terrorist attack on America. As the United States became preoccupied with conflicts in Afghanistan and Iraq, constructive interaction with China became more important. The pragmatic cooperation in this decade was based on circumstances. Both administrations benefitted from positive engagement in various areas. It supported stability in the Asia-Pacific, a peaceful Korean Peninsula, and peace in the Taiwan Strait. US and Chinese leaders also cooperated in varying degrees to foster global peace and prosperity and to deal with climate change, terrorism, and nonproliferation. Both administrations saw that the two powers had become so interdependent that emphasizing the negatives in their relationship would hurt the other side but also would hurt them. Such interdependence was particularly strong in Sino-American economic relations. Both leaderships were preoccupied with a long list of urgent domestic and foreign priorities; in this situation, one of the last things they sought was a serious confrontation in relations with one another. From the end of 2009 to the end of 2010, Sino-US relations were troubled, notably by security issues with differences over North Korea in the forefront. Yet, by early 2011, the two sides were again focusing on common interests on the Korean Peninsula, keeping alive hopes that no fundamental change had occurred from the prior cooperative mood. Relations deteriorated over economic disputes during the US presidential campaign in 2012. China became more assertive in support of its interests at odds with the United States, notably claims to disputed territory in the East and South China Seas. The Obama government focused on a new approach known as the “rebalance” in the broad Asia-Pacific region that had military, economic, and diplomatic dimensions at odds with Chinese interests. Relations became more overtly competitive.4 Nevertheless, given its many preoccupations at home and abroad, the Obama government seemed disinclined for the rest of its term to depart from the path of pragmatic engagement with China. It was up to Xi Jinping to determine whether or not relations would deteriorate further. The government orchestrated the largest mass demonstration against a foreign target ever seen in Chinese history (against Japan over disputed islands in September 2012). It followed with intense political, economic, and security pressure on Japan unseen since World War II. China used coercive and intimidating means to extend control of disputed territory at neighbors’ expense. Chinese officials dismissed and rebuffed US and other complaints that their actions upset regional stability. Despite increasing US complaints, the new Chinese government continued manipulative economic practices, cyber theft, and reluctance to contribute regional and global common goods. China used its large foreign exchange reserves and trading capacity to develop international banks and to support often grandiose Chinese plans for Asian and global investments, loans, and trade areas that excluded the United States and countered American initiatives and support for existing international economic institutions. Xi Jinping tightened political control domestically in ways grossly offensive to American representatives seeking political liberalization and better human rights conditions in China. The Chinese advances were supported by ever expanding Chinese capabilities backed by the impressive and growing economic and military power of China. The Chinese military capabilities were arrayed against and focused on the American forces in the Asia-Pacific region. Official Chinese media highlighted Xi’s leadership; he was depicted in glowing accounts directing multifaceted Chinese initiatives abroad with confidence and authority in pursuit of his broad vision of a unified, powerful, and internationally respected China—what Xi and the Chinese publicists called the “China Dream.” Complaints by neighbors, the United States, and other powers concerned with the negative impacts of Xi’s actions were rebuked or scorned. These choices seem extreme and are unattractive to many Americans. They involve risk of great power war on the one hand or American appeasement on the other. the need for major reform of an economic model in use in China for over three decades, which is widely seen to have reached a point of diminishing returns. That China’s leadership remains uncertain and fractious in how to deal with these issues was underlined by the resort to state-intervention (notably at odds with the announced economic reforms) to try to limit the damage from the recent stock market sell off and the negative consequences for Chinese trade resulting from the upward valuation of the Chinese currency. Reports of the results of the leaders’ annual retreat at the seaside resort Beidaihe in August said that Xi’s reform efforts were encountering extraordinarily “fierce resistance.”16 How much these domestic priorities preoccupy Chinese leaders and affect their policy toward America is not known but on balance they seem to incline Chinese leaders to avoid big problems with the United States. The power of interdependence to constrain assertive and disruptive actions has limits. Nevertheless, China’s uncertain domestic situation seems unprepared to absorb the shock of an abrupt shut down of normal economic interaction that might result from a confrontation with America. And both sides have become increasingly aware of how their respective interests are tied to the well-being and success of the other; thereby limiting the tendency of the past to apply pressure on one another. China’s expanding military capabilities and related civilian security capabilities. The Xi government’s policies for two years drove relations with Japan to their lowest point since WWII. Japan’s effective firmness backed with stronger support from an increasingly concerned America saw Xi change course—predictably without acknowledging any failure of past policy—in seeking less acrimonious, albeit still negative, relations with Japan in 2015. Xi’s policies drove relations with North Korea to their lowest point ever; more than ever China appears unable to secure its interests in this critically important area. Most Southeast Asian nations did not challenge China publicly over the South China Sea, but Chinese expansion put the United States on alert; it prepared militarily with Japan, Australia, and key Southeast Asian governments. The Xi government’s mix of economic and political overtures with military force demonstrations drove New Delhi to advance ties with the United States, Japan, and Australia to protect against China. Additionally, Taiwan and Hong Kong experienced unanticipated mass demonstrations and political developments sharply at odds with Chinese interests; in neither case did Xi’s China show a smooth path for advancing Chinese influence and control. A major test looms with the expected election of the Democratic Progressive Party (DPP) candidate in the January 2016 presidential elections. The DPP has opposed many aspects of the recent Taiwan’s government’s reassurance of and closer relationship with China. The Xi Jinping government had an easier time improving relations with various Silk Road and other initiatives in Central Asia and with Russia now isolated from the West. But overall it was clear that China’s position in nearby Asia declined markedly due to Xi’s overreaching assertiveness. The Xi Jinping government emphasizes massive plans for Chinese investment and financing abroad. The initiatives modify strong “going out” policies of Chinese investment and financing during the previous decade. The latter saw Chinese built infrastructure to access needed raw materials. The new investment and financing push enables construction abroad of Chinese supplied infrastructure by the enormous excess capacity of Chinese companies made idle inside China because of recent economic reforms. US weaknesses in the Asia-Pacific included the foreign policies of the George W. Bush administration, which were very unpopular with regional elites and public opinion. The Barack Obama government refocused US attention positively on the Asia-Pacific region; regional concerns shifted to worry that US budget difficulties and political gridlock would undermine support for regional responsibilities. Thus far, the rebalance policy is being implemented in ways that ease these concerns and reinforce US strengths. In most of Asia, governments are strong and make the decisions that determine the direction of foreign affairs. In general, their legitimacy and success rests on nation building and economic development, which require a stable and secure international environment. Unfortunately, Asia is not particularly stable, and most regional governments are privately wary of and tend not to trust each other. As a result, they look to the United States to provide the security they need, recognizing that this security role is very expensive and involves great risk, including large-scale casualties if necessary. They also recognize that neither China nor any other Asian power or coalition of powers is able or willing to undertake even a fraction of these risks, costs, and responsibilities. The nation-building priority of most Asian governments depends importantly on export-oriented growth. Much of Chinese and Asian trade heavily depends on exports to developed countries, notably the United States. The United States runs a massive trade deficit with China, and a total annual trade deficit with Asia valued at over USD 400 billion. Asian government officials recognize that China, which runs an overall trade surplus, and other trading partners of Asia are unwilling and unable to bear even a fraction of the cost of such large trade deficits, which, nonetheless, are very important for their governments. The Obama government’s emphasis on consultations with regional stakeholders has been broadly welcomed and stands in contrast with China’s increasing demands in Asia. The Pacific Command leads US security organizations in wide-ranging and growing webs of intelligence and security relationships throughout the region that China, adverse to the costs of alliances and lasting foreign commitments, is only beginning to consider. The United States, reaching back to past centuries, has engaged the Asia-Pacific through business, religious, educational, media, foundation, and other generally positive interchange. This active interaction puts the United States in a unique position and reinforces its overall influence.24 Meanwhile, fifty years of generally color-blind immigration policy since the ending of discriminatory US restrictions on Asian immigration in 1965 has resulted in the influx of millions of Asia-Pacific migrants, who call America home and who interact with their countries of origin in ways that undergird the American position in the region. Part of the reason for the success of US efforts to build webs of security-related and other relationships with Asia-Pacific countries has to do with active contingency planning by many Asia-Pacific governments. Given recent Chinese demands, coercion and intimidation, the Asia-Pacific governments’ interest in such ties with the United States has increased. The September 2015 Washington summit has changed little in the underlying dynamics determining the recent decline in China-US relations. Circumstances enable Xi Jinping’s recent policy choices undermining American interests. Thus, we should expect China to militarize the newly created islands in the South China Sea and use them to seek dominant control in this sensitive area. We should anticipate Beijing taking other bold steps forward in asserting economic power at American expense, as it has done with the Asian Infrastructure Investment Bank and with massive promises of investment and development assistance abroad. The arrows in China’s quiver will include initiatives unexpected by foreign observers. Such activism and boldness are well received by audiences in China. Among the circumstances allowing Chinese assertiveness is that Obama seems weak and too preoccupied with other issues to take more resolute actions designed to get China to stop actions deemed offensive. Perhaps, the US government’s extraordinary publicly displayed diplomatic efforts to pressure the Chinese on cyber security will result in meaningful changes, and perhaps they will not if the Chinese judge that the United States still remains reluctant to employ power against China on such sensitive matters. Many American leaders and specialists inside and outside the government have a number of proposals for action.26 The realities of power in Asia and China’s continued reluctance to confront powerful America would support a tougher American stance against China’s advances. Depending on who wins the 2016 election, some of the proposals for action will be adopted. How much US attention is devoted to China will depend heavily on how China continues the offensive actions. At present, the China debate is only one of several important foreign policy issues in the US election campaign that focus on perceived US weaknesses in dealing with an array of international challenges. One obvious outcome of recent developments is that few Americans will anymore believe Xi’s pledges for a “new relationship” with the United States. Those rhetorical calls increasingly ring hollow in the face of China’s actions against important American interests; they show Xi to be duplicitous, playing a “double game” of promising good relations while moving full speed ahead with policies that undermine America.27 As a future US government prepares to deal with Xi’s advances, it will likely view the Chinese leader as less trustworthy and predictable than earlier Chinese leaders. 1. David Shambaugh, ed., Tangled Titans: The United States and China (Lanham MD: Rowman and Littlefield, 2012); Robert Zoellick, “Whither China: From Membership to Responsibility” (speech on September 21, 2005), http://2001-2009.state.gov/s/d/former/zoellick/rem/53682.htm; Elizabeth Economy and Adam Segal, “The G-2 Mirage,” Foreign Affairs, May/June 2009, http://www.foreignaffairs.com/articles/64996/elizabeth-c-economy-and-adam-segal/the-g-2-mirage; Robert Blackwill and Ashley Tellis: Revising US Grand Strategy Toward China (Washington DC: Council on Foreign Relations, 2015). 2. Robert Sutter, Foreign Relations of the PRC (Lanham MD: Rowman & Littlefield, 2013), 10-14. 3. Jeffrey Bader, Obama and China’s Rise (Washington DC: Brookings Institution, 2012). 4. Robert Sutter, The United States and Asia (Lanham MD: Rowman & Littlefield, 2015), 60-67. 5. Assessments of US-Chinese relations in this period include Bader’s Obama and China’s Rise; Martin Indyk, Kenneth Lieberthal, Michael O’Hanlon, Bending History: Barack Obama’s Foreign Policy (Washington, DC: Brookings Institution, 2012), 24–69; Aaron Friedberg, A Contest for Supremacy (New York: W.W. Norton, 2011); Kenneth Lieberthal and Wang Jisi, Addressing US-China Strategic Distrust (Washington DC: Brookings Institution, 2012); Andrew Nathan and Andrew Scobell, China’s Search for Security (New York: Columbia University Press, 2012); Denny Roy, Return of the Dragon (New York: Columbia University Press, 2013); Nina Hachigian ed., Debating China (New York: Oxford University Press, 2014); Lyle Goldstein, Meeting China Halfway (Washington DC: Georgetown University Press, 2015); and Thomas Christensen (The China Challenge New York: W.W. Norton, 2015). 6. 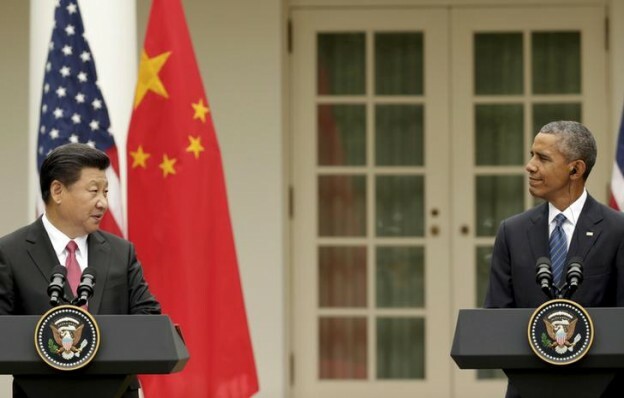 Shannon Tiezzi, “American Government Torn on How to Handle China,” The Diplomat, August 4, 2015, http://thediplomat.com/2015/08/americas-government-is-torn-on-how-to-handle-china/; Robert Sutter, “Americans Speak to US-China Policy: Let’s Be Frank,” National Bureau of Asian Research, September 18, 2015, http://xivisit.nbr.org/2015/09/18/americans-speak-to-u-s-china-policy-robert-sutter/. 7. Reviewed in Sutter, The United States and Asia, 307-314. See also more extensive treatment in Robert Sutter, Chinese Foreign Relations: Power and Policy Since the Cold War (fourth edition) (Lanham MD: Rowman & Littlefield, 2016). 10. Aaron Friedberg, Beyond Air-Sea Battle (London: Routledge, 2014); Blackwill and Tellis, Revising US Grand Strategy; Goldstein, Meeting China Halfway. 11. Christensen, The China Challenge; Joseph Nye, Is the American Century Over? (Cambridge MA: Polity Press, 2015); Paul Dibb and John Lee, “Why China will not become the dominant power in Asia,” Security Challenges 10, no. 3 (2014): 1-21; Evelyn Goh, The Struggle for Order: Hegemony, Hierarchy and Transition in Post–Cold War East Asia (London: Oxford University Press, 2013). 12. Sutter, Foreign Relations of the PRC, 215-217; Sutter, The United States and Asia, 112-132. 13. David M. Lampton, Following the Leader: Ruling China from Deng Xiaoping to Xi Jinping (Berkeley: University of California Press, 2014); Nathan and Scobell, China’s Search for Security; Denny Roy, Return of the Dragon. 15. Feng Zhaokui, “China Still a Developing Nation,” China Daily, May 6, 2010, 12. 16. Keira Lu Huang, “Xi Jinping’s reforms encounter ‘unimaginably fierce resistance,” South China Morning Post, August 21, 2015, http://www.scmp.com/news/china/policies-politics/article/1851314/xi-jinpings-reforms-encountering-fierce-resistance. 17. This dualism and respective Gulliver strategies are discussed in Robert Sutter, “China and US Security and Economic Interests: Opportunities and Challenges,” in Robert Ross and Oystein Tunsjo, eds., US-China-EU Relations: Managing the New World Order (London: Routledge, 2010); James Shinn, Weaving the Net (New York: Council on Foreign Relations, 1996). 18. This section summarizes findings in Sutter, Foreign Relations of the PRC, 1–26 and 311–327; and in Sutter, The United States and Asia, 109-134. 19. Robert Sutter, “Xi Jinping’s foreign policy: Image versus reality,” Pacnet Number 38 (July 7, 2015), http://csis.org/files/publication/Pac1538.pdf; see full treatment of items in this section in Sutter, Chinese Foreign Relations. 20. Robert Rotberg, “China’s $1 trillion for Africa,” China-US Focus, November 26, 2013, http://www.chinausfocus.com/finance-economy/chinas-1-trillion-for-africa/; Rebecca Ray and Kevin Gallagher, “2013 China-Latin America Economic Bulletin,” Global Economic Governance Initiative, https://ase.tufts.edu/gdae/Pubs/rp/wg/WG_ChinaLA_Bulletin_2013.pdf (accessed June 28, 2015). 21. “China in Africa: One among many,” The Economist, January 17, 2015, http://www.economist.com/news/middle-east-and-africa/21639554-china-has-become-big-africa-now-backlash-one-among-many; Ray and Gallagher, 2013 China-Latin America Economic Bulletin. 22. Linda Yulisman, “Indonesia: Indonesia to push China to realize investment, “Jakarta Post, April 4, 2015, http://www.thejakartapost.com/news/2015/04/04/indonesia-push-china-realize-investment.html; Dinna Wisnu, “Indonesia: Jokowi’s visits to Japan and China: What’s in it for us?” Jakarta Post, April 7, 2015, http://www.thejakartapost.com/news/2015/04/07/jokowi-s-visits-japan-and-china-what-s-it-us.html; Huang Yiping, “Pragmatism can lead to Silk Road’s success,” China Daily, February 25, 2015, http://repubhub.icopyright.net/freePost.act?tag=3.15484?icx_id=48971175; Toh Han Shih, “Chinese investors warned about African mining risks,” South China Morning Post, December 16, 2013, http://www.scmp.com/business/commodities/article/1381796/chinese-investors-warned-about-african-mining-risks. 23. See coverage of these issues in Sutter, The United States and Asia, 120-126. 24. During a speech in Manila in December 2013, Secretary of State John Kerry highlighted the millions of dollars of assistance to Philippine storm victims coming from such US business partners as Coca-Cola, Proctor & Gamble, Dow Chemical, Fed-Ex, Cargill, and Citibank. “Kerry Speaks in the Philippines,” Asian American Press, December 17, 2013, http://aapress.com/ethnicity/filipino/kerry-speaks-in-the-philippines. 25. Dan Blumenthal, “Rolling Out the Red Carpet Won’t Make China Play Nice,” Foreign Policy, September 9, 2015, http://foreignpolicy.com/2015/09/09/rolling-out-the-red-carpet-wont-make-china-play-nice/. 26. David Michael Lampton, “The US-China Summit: Decoding the Tower of Babel,” The Diplomat, August 31, 2015, http://thediplomat.com/2015/08/the-u-s-china-summit-decoding-a-tower-of-babel/. 27. Robert Sutter, “Americans Speak to US-China Policy: Let’s Be Frank,” National Bureau of Asian Research, September 18, 2015, http://xivisit.nbr.org/2015/09/18/americans-speak-to-u-s-china-policy-robert-sutter/.